When my female hamster 'Sherbet' was pregnant, I was so happy and I was even happier when 8 little wriggly baby hamsters were born even though they were born on Friday the 13th! On day two, I noticed that there was one hamster in the corner away from the rest of the baby hamsters and when I looked closer it was stiff and blue. Unfortunately, with one dead hamster I worried about the remaining seven baby hamsters. As the weeks went by and they were old enough to be held, I realised out of the seven, one tiny hamster was cold and weak, he was the runt of the litter and everyone said that he wouldn't last long and that eventually would die. He was also blind and deaf. Determined, I gave him the name 'Chico'. I spent long hours feeding him warm milk and baby food. Even though the odds were against my little baby Chico, he surprised every one and slowly got stronger and stronger. When Chico and the other baby hamsters were ready to be sold, I realised I couldn't let go of my special little boy or his brothers and sisters and when I spoke to my parents they were very understanding and allowed me to keep all seven of the bundles of fluff. 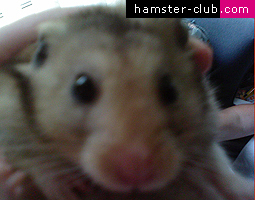 As the months rolled by (without any problems), they all developed their own different personalities and Chico was a noisy and extremely playful hamster but also a very loving and affectionate hamster. Their first birthday came and went but they soon started to age and slow down including Chico and when it came to his second birthday his age started showing even more, then he stopped biting his cage wires which he loved. At that moment, I knew that he would soon go. As painful as it was I pushed it to the back of my mind. When Chico was 2 and a half (which is a very old age for a hamster), something took a turn for the worst as he became extremely weak and he stopped eating and drinking. I started feeding him through a syringe; willing him to live, it was like when he was a baby all over again. On the 26th of August 2008 he was weaker than usual and I knew I didn't have much longer with him. I spent the whole night cuddling him and praying he would survive even if just for another day. I wrapped Chico in a tea towel as his body felt so cold and his lips was turning blue I layed him in his cage and fell asleep. The next morning I went to see him but his whole body was stiff and I knew that he was gone and though my heart ached and I cried, I knew now that he was gone he would be at peace and he wouldn't have to suffer anymore. My mum said that we could bury him in the back garden under the bronze cottage statue, his new home. We sang a song I made for him and I laid a red rose on his grave. When I got inside all Chico's brothers and sisters looked up at me I knew they sensed my loss and I could see that they all knew they had just lost their brother hamster. 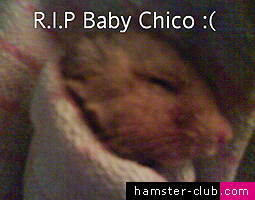 I hope when you go to sleep you can say a little prayer for Chico the hamster.